Is The Blueprint Model right for me? What is The Blueprint Model? Can I access everything all at once? I'm interested in The Blueprint Model, but scared of an online experience because I'm such an "in-real-life" type of person. Who’s not right for The Blueprint Model? Is The Blueprint Model industry specific? Is The Blueprint Model just for women? My business is brand new, like brand spanking new. Is it too early to invest in this program? Should I wait until I've been in business longer? Will this work if I live outside of North America? Can my partner and I take The Blueprint Model together? Will I speak with or get feedback directly from Shanna? Do we have access to the BPM online if we attend LIVE? Will we get dedicated one-on-one appointment times with Shanna during LIVE? Will we get digital copies of materials when attending LIVE? Will the industry-specific add-ons to the Blueprint Model be available this year? Where and when is Blueprint Summit?! Exclusive access to our members-only community. Hear what our community is raving about. Be the first to hear about 2020 enrollment details. THE BLUEPRINT MODEL is a 12-week online business course, designed for any creative entrepreneur wanting to make real money with their creative dreams. The Blueprint Model is your a-z guide to starting, growing, or rescuing your creative business! You'll learn everything you need from pricing to operations, branding to marketing, financial planning to boundaries. This comprehensive 12-week online business course is a MUST for any creative entrepreneur wanting to make real money with their creative dreams without sacrificing every waking hour to the non-stop hustle! In my signature 12-week online business program, I'll walk you through my proven step-by-step blueprint to build the business plan you've needed since day one: a solid foundation with clearly-defined services, pricing based on real numbers, and a plan to steward those (exciting new) profits. It's lifted the load off thousands of weary creatives, and no matter where you are in business, it's going to help you, too. Price for Profit on every project, every time! Pay Yourself on a consistent, monthly basis without worrying about having enough! Attract more ideal clients and build an audience of raving fans! Balance your work and home life without sacrificing what you love most! Create a sales goal and a financial plan to steward those profits with intention! Everything is Online: No Travel Required. So you can participate from the comfort of your own couch! All course materials, including streaming videos, MP3s, transcripts, guided workbook and additional resources are within the online member portal. You’ll also be able to ask questions, get feedback and connect with fellow Blueprinters online. If you plan to work through the live program in real time, we recommend between 4-6 hours per week to watch the training, complete your workbook and assignments and — if you’d like — engage with the Blueprint community. If you’re not able to carve out that much time at first, don’t worry. You’ll have six full months to watch the nine core building blocks allowing you to work at your own pace, on your own schedule. Most of our students have full-time jobs or businesses and families. This experience is designed to stretch you, but it can also be customized to your life. To be clear, there are no fast or guaranteed results. Building a business is not a 12-week one, linear path. This program mirrors the reality of entrepreneurship — it’s intense, time consuming, demanding and something you’ll work on for the life of your business. There are nine core building blocks of the Blueprint Model curriculum, and we release one building block per week. Each video lesson is 20-30 minutes long plus corresponding guided assignments in your workbook to help you integrate and apply what you learn to your business. You’ll also get three full weeks of implementation (every fourth week) and at the end of the program, where no new content is released. These open weeks are designed to give you a chance to catch up on the training, reflect and take action. Once the initial 12 weeks are complete and all content has been released, you’ll have access to the entire library of training materials inside the member portal and can revisit and review as often as you like. Think of open enrollment like a semester in school! We open enrollment for seven days in early January. Enrollment always closes on a Thursday night and doors open on Friday morning. You’re greeted with a welcome video and have the weekend to buy your school supplies. We all start the training together the very next week! Cue the hand clappers! The magic of The Blueprint Model is in the process. While you could spend years googling “how to run a creative business”, “how to price for profit” or “how to streamline my process” and come up with some great answers, The Blueprint Model will fast-track your growth by given a done-for-you, proven business model to go by. You want to learn how to launch your own online course. There are many other programs specific to that. It’s not about personal finance, you’re looking for Blueprint at Home. Not a get rich quick scheme. If you don’t want to put in the work, this isn’t the program for you. We also don’t cover anything dealing with choosing legal business structure, insurance, trademarking. In regards to legal, tax or liability while we may provide some common for-information only content, this curriculum does not replace the advice of a professional team. This is what my friend Jessica said about in person versus online (her words) : "I did have the luxury of having Shanna one-on-one for six months, BUT I also did the program and the biggest compliment I can give it is that a) it genuinely feels the exact same - like she’s right there with you guiding you each step of the way. b) I actually think it’s BETTER than a one-on-one because she teaches you through the program how to think for yourself and how to figure out problems yourself. Before doing the actual program myself, there were things I didn’t know how to do for myself and I so wish that I did. If I knew how to make my own projection - I wouldn’t have to wait for Shanna’s availability and pay for it - I could just do it for myself." Also just to ease your online fears a little more : we currently have a 90% completion rate. I’m super proud of that. I do what I can to help motivate and encourage accountability, while still giving you the reigns to do the work. While most online courses sit on the virtual shelf we’ve designed our program to encourage completion. We are proud to have a 90% completion rate. We also offer The Blueprint Model Retreat which is the same curriculum in-person over a three day all-inclusive luxury retreat! The Blueprint Model is for creatives, freelancers, small business owners, established and aspiring entrepreneurs. It’s for dreamers ready to turn their passion or side-hustle into a full time business and evolving businesses who want direction, clarity and help making money doing what they love. Our students represent more than 50+ industries and dot the map across 15 countries all over the world. 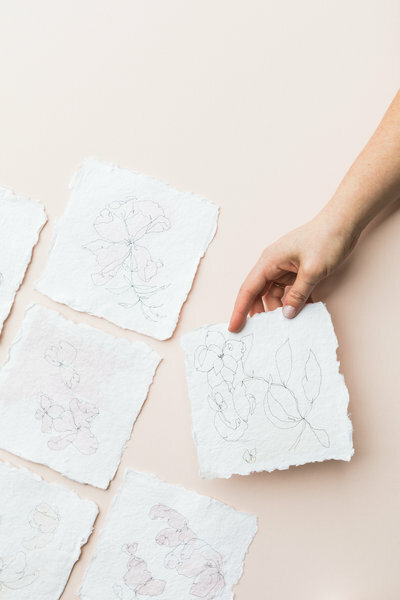 From floral design to paper goods, retail shop owners, brick and mortar stores, interior designers, wedding dress makers, craft fair makers, to virtual assistants — The Blueprint Model teaches you have to be a better business owner. If you have ever dreamed of owning a business, if you’re currently in the throws of starting your business, or if you’re already ten years in and somewhat drowning under your business The Blueprint model will teach you the essential business tools you must have in order to run a profitable, sustainable, life-enriching business. This is information every business owner must have to run a business. The Blueprint Model is not the right fit if you’re looking for a one-on-one business coach or an in-person retreat. It’s also not right for you if you’re looking for help with legal setup, tax structures, scaling your existing business, or exit strategies. It’s also not right for you if you’re already booking your ideal clients/jobs/projects, you’ve mastered your money, you feel confident in pricing and sales, or consider yourself an expert in all things business operations and finance. This program isn’t right for you if you aren’t willing to put in the hard work or if you’re looking for a plug-in-play done-for-you business in a box mentality. While the blueprint model is a proven system, you still have to put in the work to implement it for you, your industry and your location. Our students represent more than 50+ industries and dot the map across 15 countries all over the world. No matter what you sell, you must understand how to manage your business finances, talk about money with your clients and make the sell, balance your business and personal life, systemize your processes and master your mindset. Regardless of your industry, The Blueprint Model teaches timeless business principles that are will serve you for a lifetime so if you ever want to pivot your business model, diversify your income streams, or build a company viable to sell, you’ll have the tools you need to do that. The Blueprint Model is just a one-time solution to a current problem. Is will change the way you think about yourself, your business and your life. Not only are the tools you’ll find inside invaluable, the confidence and strategic thinking you’ll develop are life-changing. No. While the majority of our students are women, we do have a growing group of male blueprinters! While I might “speak” to the ladies assuming our majority audience, the content is not gender specific and everyone is welcome in the program. Business content = business content. Everyone needs to know this stuff to run a profitable, sustainable, life-enriching business! Great question! Honestly, I wish every business could take this program before even opening their doors! It would save so many hours of wasted time, spinning wheels and let's face it, MONEY! You may not have as much historical data to review, but that won't stop you from building a plan going forward! My friend Katie said it like this : "You would be crazy not to buy the course. :) It's like preventative medicine. You need to know all these things and act on them now, or they will haunt you later." Or my friend Kaitie (with an ‘i’) who said, "It’s the MBA for creatives! I wish I had done this years ago. I would be so much further along in my business." Yes! While many financial principles are location specific (I always advocate for finding local help), the principles you’ll learn are universally applicable. We have students in over 15 countries spanning across the world. The Blueprint Model teaches concepts every business owner needs to know that will be benefit you for a lifetime. The enrollment fee for The Blueprint Model is a one-time payment of $1997. We do offer a 3-month payment plans during open enrollment at $750 for 3 months. Traditional MBA programs can cost anywhere from $80,000 to $140,000 or more. Plus, those programs don’t come with a money-back guarantee! The Blueprint Model does. The Blueprint Model is an investment for any business owner seriously committed to growth. It’s a commitment of time, energy and money. But that’s the reason it’s so life-changing for those who put in the work! Hear more Blueprint Model testimonials from our students here. Yes, we offer a 30-day (from the date of purchase) no questions answered money-back guarantee. We also accept PayPal. We are not currently able to accept payment by check. Your purchase includes a 1-user license. If you’d like to take the program with your business partner, you may purchase an additional user license for $200. Please email our team at support@shannaskidmore.com for details. This is a group learning experience so getting guidance and support is never more than a few clicks of your keyboard away! You have access to outstanding support from Team Skidmore and a diverse and encouraging community of Blueprint alum who are always ready to help newcomers! The program is designed by Shanna and while she’s an active member during our live session in the member are comments, as well as weekly office hours, we cannot guarantee individual feedback from her. Yes. We do offer lifetime access. Here’s how it works: You have six-months to complete the nine core building blocks of The Blueprint Model (that means watch, listen or read the transcript in full and mark complete). Once the core curriculum has been completed you will unlock lifetime access to the program ensuring you can revisit the curriculum as often as you’d like, as long as the program is available. Enrollment for The Blueprint Model is only open once per year. Write us at support@shannaskidmore.com and we’ll happily take care of you. You can also hear straight from our grads here. Blueprint Summit is the live, in-person, next-level business conference exclusively for our Blueprint Community! We think of it as our annual family reunion (without the weird potluck buffet dinners of course!) ! It's a great way to meet your fellow blueprint community IRL, hug Shanna's neck and learn valuable content to take your business to the next level! Summit is early November every year. Location TBD. No, although you will have the opportunity to purchase access to The Blueprint Model online curriculum if you want digital, lifetime access to the same course content you learned in-person over your three days at LIVE. If you purchase DURING the event (before you leave Grove Park Inn) the purchase price is $500. If you purchase within 30 days of the event, the purchase price is $1,000. After 30 days, enrollment will open again the January of the following year. The agenda has not been officially set yet, but Shanna would like to run the entire event “workshop style." This means you will have lots of opportunities for hands-on learning and face-time with Shanna to ask questions and dive deeper into topics as they pertain to you and your business. Her goal is to keep the learning style as informal as possible, so setting appointment times may not fit into the overall agenda. Please be assured, however, you are guaranteed to have lots of opportunities to speak to Shanna throughout the three days! No, all materials will be printed. If you think you would benefit from digital documents as well as printed, we would suggest also purchasing the online version at the discounted price during the event. If you purchase during the event (before you leave Grove Park Inn) the purchase price is $500. If you purchase within 30 days of the event, the purchase price is $1,000. After 30 days, enrollment will open again the January of the following year. No, they will not be offered this year. The feedback from last year’s students, specifically those who purchased the industry specific add-ons, was that it was too much content and it was hard to work through everything and walk away with actionable steps. It is for this reason that we will be offering the industry specific add-ons for purchase when the Shop opens in July 2019. We believe that once the proper foundation for your business is laid with The Blueprint Model, you will then be poised to learn more with the industry specific add-ons.